Now over 50 years old the golf course still stands as one of the best tests of golf in the Country. With the latest course enhancements now complete the Club is proud to offer three tee options for ladies and four options for men. Distance ranges from the green tee yardage of 5295 to the 7247 yards from the black tees. 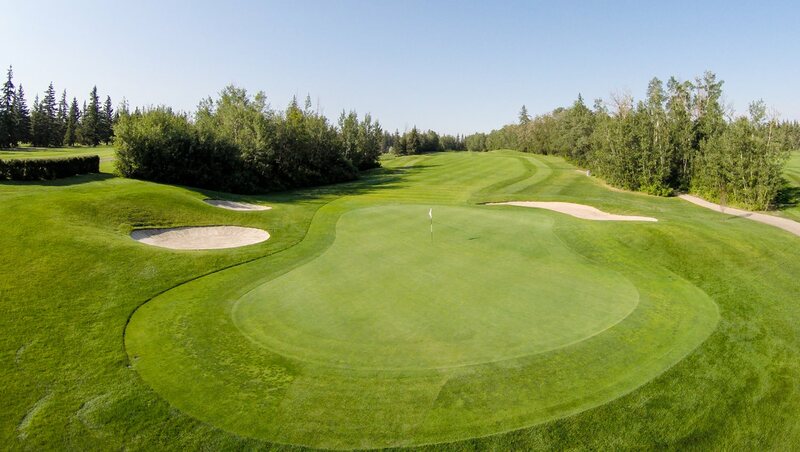 The first hole provides a generous driving area to “work out the kinks” off the first tee, however be aware of the looming danger of four fairway bunkers that are reachable off the tee. Depending on the location of the tee markers, the water will loom larger and larger as the markers go back. The dogleg lefts dictates a right to left shot to the corner leaving a 225 yard uphill approach to a large green with a false front. Avoiding the treacherous bunker on the right side of the green will allow the player an excellent opportunity for birdie. If your drive has forced you to lay up, be precise with your distance on your third shot, as you will be playing into a deceptively deep green. Notorious swirling winds make this 190 yard downhill par 3 more difficult than would be expected standing on the tee. 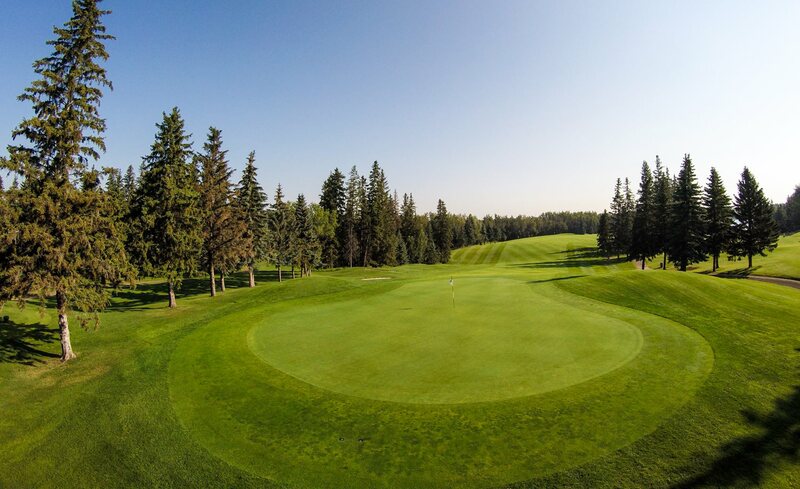 Club selection is of utmost importance, as a shot to the middle of the green will set up your best chance for par. The ideal tee shot favors the right half of the fairway, as anything close to the left will almost certainly roll down into the rough leaving a blind shot to one of the toughest greens on the course. Take careful notice of the pin position, as anything past the flag - especially a front right pin - will almost guarantee at least a three putt. This 3 par can play up to four different clubs off the tee. Although you almost certainly can not feel it on the tee the prevailing wind is into the player’s face. A picturesque hole that can provide quite an intimidating “Sunday” pin placement on the back right shelf, guarded by a large bunker. Any tee shot past any pin placement will require a deft touch coming back downhill to the pin. Distance and accuracy off the tee is paramount on this long par 5. If your drive lands over the crest of the hill it will roll down the backside and leave you with an opportunity to reach the green in two. More often than not, however, the player will be faced with a decision that will place importance on the location of your lay up being minful that the fairway pushes the ball to the water hazard on the right. Confirm your yardage for the delicate wedge shot keeping in mind that your best bet at par is to stay below the pin and to the left side of the green. A short par 4 that does not place an importance to distance off the tee, but does set up better coming into the front to back sloped green from the left side of the fairway. 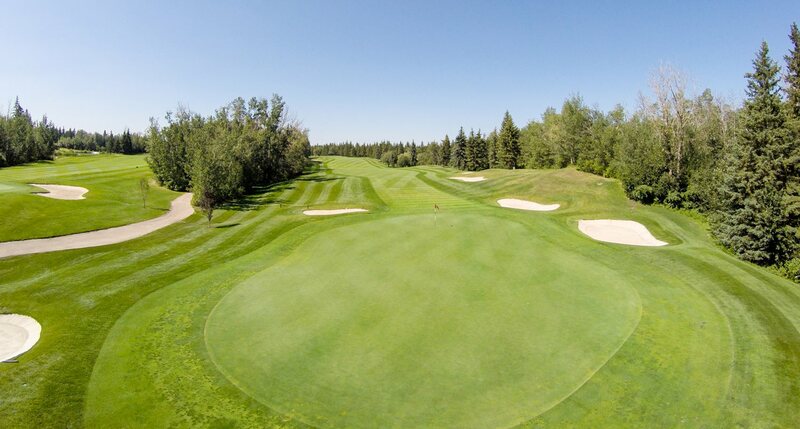 A tee shot of roughly 220 yards will set up the best to play into the front to back sloped green which will take the ball from right to left - and in a hurry! Be wary of the red pin on this hole as more often than not a shot 10 feet short of the green is the play trying to get the ball to hop up and roll forward. 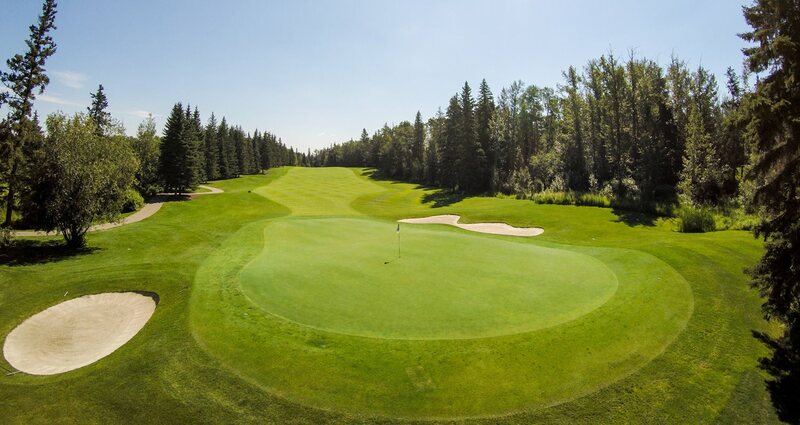 A 200-yard downhill, usually into the prevailing northeast wind, shot to a well-protected green will test your long iron play on the third par 3 of the front nine. A play to the heart of the green will provide the only real chance at a birdie, however escaping with a par is an accomplishment in itself. Perhaps no other hole on the golf course provides such importance to accuracy off the tee as the eighth. 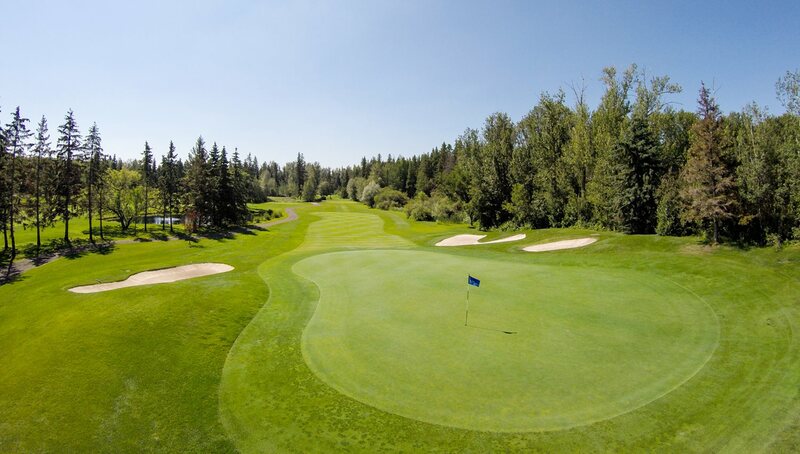 Two large bunkers on this dogleg steer the player to the right hand side of the fairway; thus increasing the distance required to play into this small, quick green. Aptly placed as the number one handicap hole of the golf course. The long hitter’s dream! A well-struck tee ball will land on the backside of a subtle hill in the middle of the fairway adding up to thirty yards of roll. Careful, though, as any ball landing too far left will be swallowed up by the rough and any ball landing too far right will most certainly end up in one of the two bunkers covering 150 yards. If your tee ball has come to rest in a position allowing you to “go for it” in two a play to the left side of the green and short will provide you with the best chance for an eagle putt. Conversely, if you have been left with a lay up the best position is to the left side of the fairway and 100 yards out leaving a shot that can hold the green if enough spin is placed on the golf ball. The approach shot is critical either way, as any ball rolling on the green will break sharply to the right and could even roll off the back. 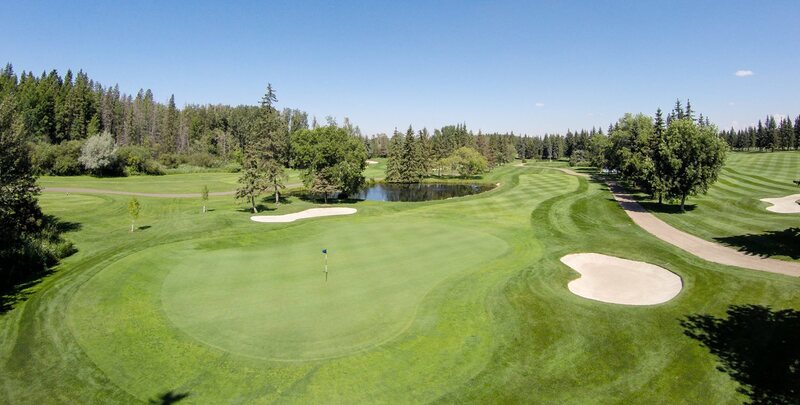 In many reader's polls in the local newspapers this hole has been voted the toughest, and best, par-4 in Edmonton, this hole requires length and accuracy off the tee and the requirement to never get past the pin on your shot into the green. 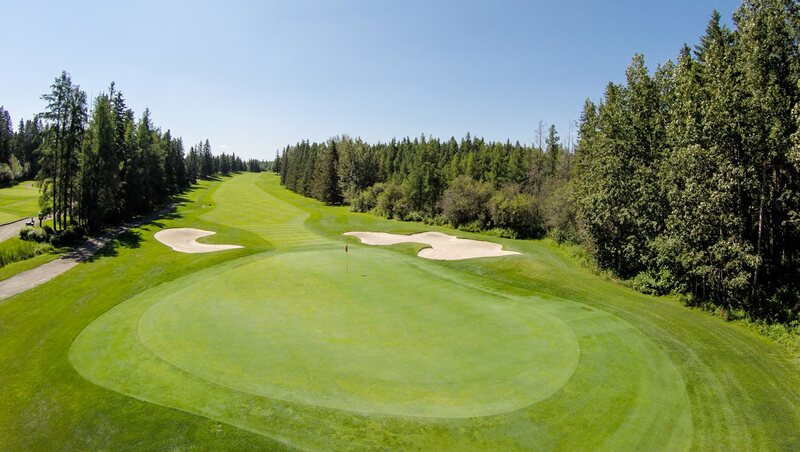 A 430 yard dog-leg left that requires a well placed tee shot which must navigate two large Spruce trees on the center left side of the fairway and the irrigation holding pond over the hill on the right. Some believe this is the fastest green on the golf course and care must be taken not to pass the flag on your approach shot. The green does slope from back to front and any approach shot must land on the front part of this very firm green or you are bound to be putting back to the flag. Long hitters can gain an extra thirty to forty yards with a well-struck drive that catches the down slope of the hill 220 yards from the tee. Most players, however, will be left with a 175-200 yard iron shot to this flat green protected on both sides of the green with deep bunkers. Once a hole that allowed a brief reprieve, this hole is now one of the toughest on the back nine. Changes to the hole in the fall of 2004 saw distance added, a re-contouring of the fairway and the development of a new green. 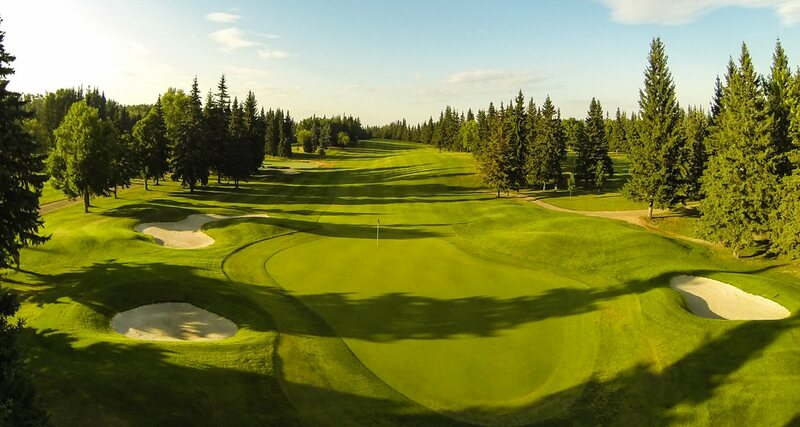 These changes have caused some Members to call the tenth, eleventh and twelfth the “Amen Corner of the North”. Standing on the tee of this 198-yard par three and looking into the green can be quite intimidating. Two bunkers and OB and trees on the left guard the huge two-tier green. If the pin is blue and on the back half of the green it might be wise to go up a club or two to ensure that your ball stays on the elevated back half of the green. Any putt is certain to deserve a second look on this green, as it has some subtle nuances. Another reachable par 5, but only if the tee ball is struck well. Any player thinking of going at the green in two must be cognizant of the narrow green and the three bunkers that guard it’s approach. Add to the fact that the approach should be hit on the front part of this firm green or risk a chip shot back to the pin and a lay up may soon be the play. An ultimate in risk-reward. This tee shot requires a slight left to right flight path to play the “lay of the land” for this slight dog leg right 400 yard hole. 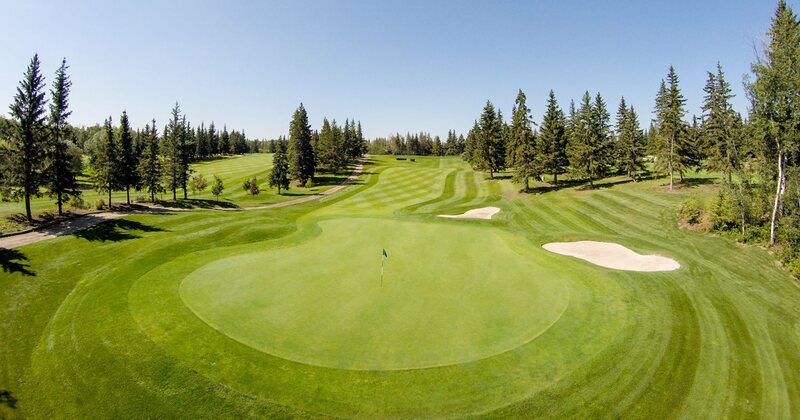 A mid to long iron shot to a large green will be the reward for a well struck tee ball, a certain bogey awaits the player who does not reach the crest of the hill off the tee. The last of a tough group of par 3′s, this hole plays all of the 200 yards it is listed at on the scorecard. Two bunkers protect this green that will usually funnel a tee shot from left to right. Although the water hazard on the right should not come into play, it should be in the back of a player’s mind as any ball hit too far right and short will certainly be wet. Most believe this hole has evolved into the Glendale’s signature hole. A big drive down the right side of the fairway missing the bunker will put thoughts of reaching the green in two into the players’ mind. Any shot at the green, however, must navigate the large water hazard and the many strategically placed bunkers. 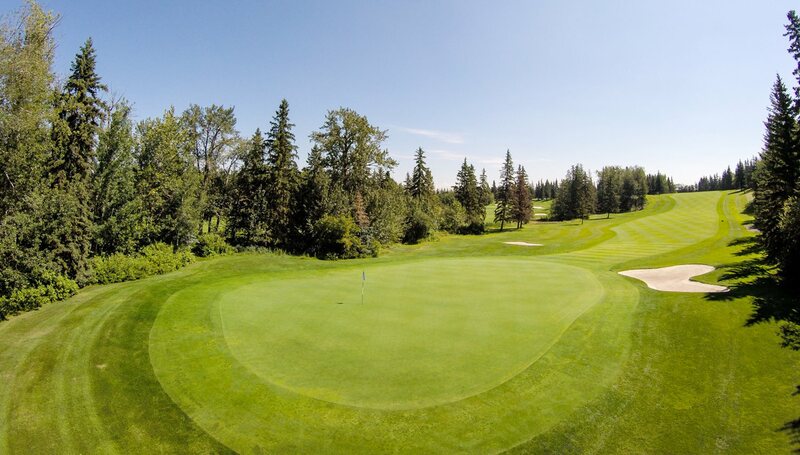 The location of your shot on this gargantuan three-tiered green is of so much importance the play is usually a lay up so that the player can choose the best location to land his shot for the best chance at a birdie putt. 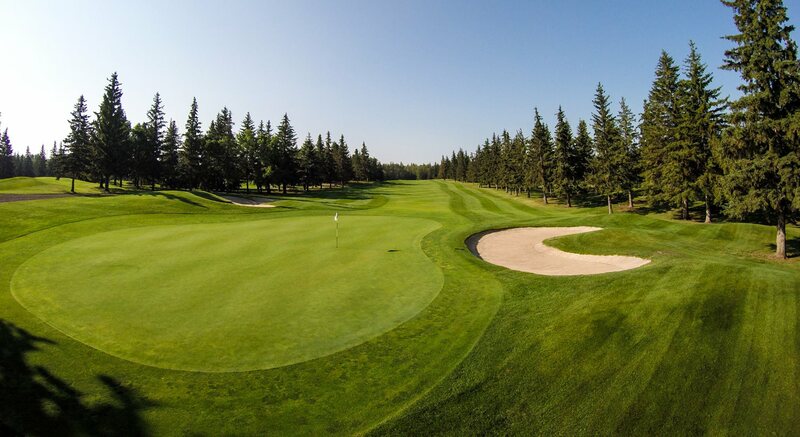 Another tree lined fairway with a water hazard tucked behind the two fairway bunkers on the right side makes driver off the tee a precarious choice. A fairway wood or long iron could be considered to allow a mid*iron into this receptive green guarded by a bunker on each side. 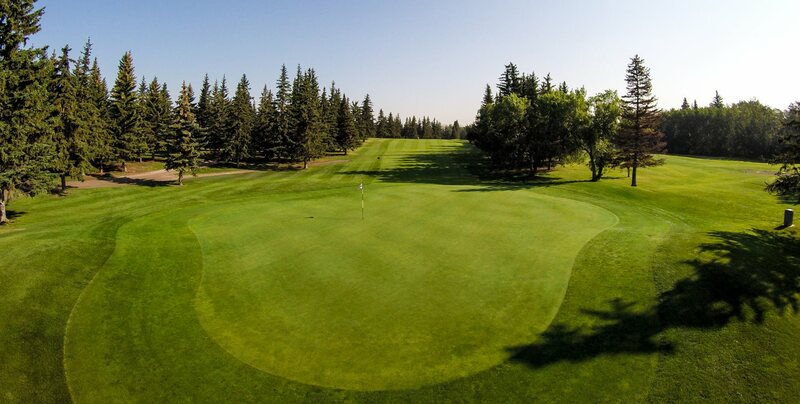 Most approach shots to the green will roll from left to right at the middle to front half of this green which does have a slight back to front slope on the back half of the putting surface.